Office yoga, yep it’s a thing. And no you don’t need your own personal yoga room to do it. While having a teacher come into your office and guide you through a class is a great perk (and definitely something you should start a petition for) it’s not always an option. 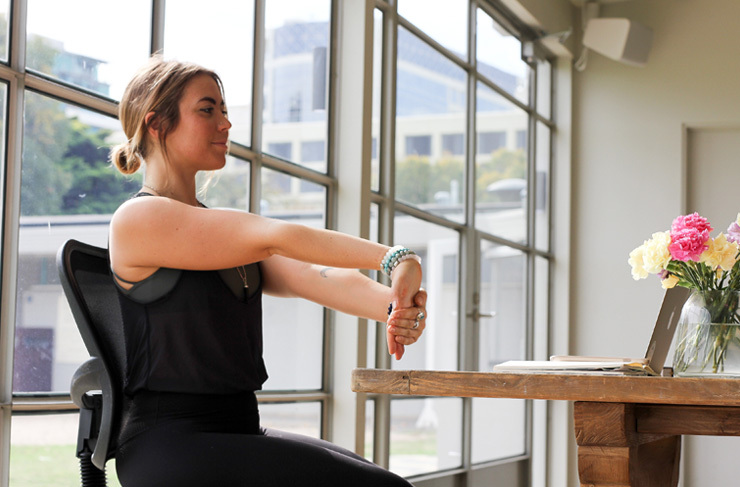 If your office is yet to jump on the #workplacewellness bandwagon, then take matters into your own hands and pioneer the office yoga revolution. It's a simple way to keep your body happy in-between typing your way to your next promotion. 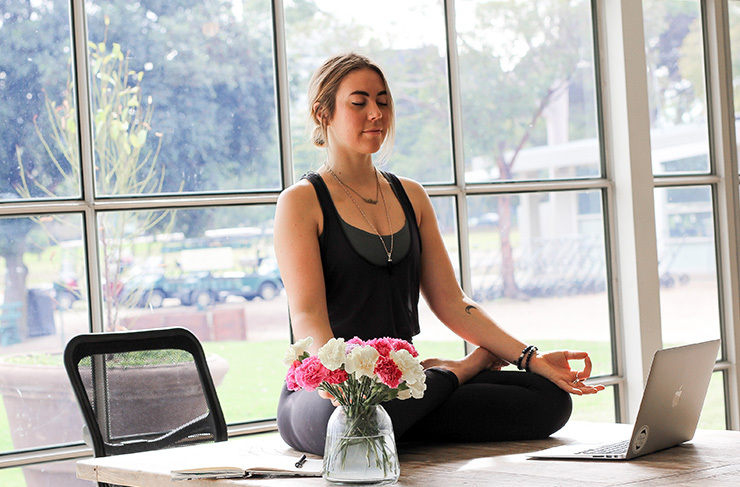 Here are 6 yoga poses you can do at your desk...without looking like a total weirdo. Everyone loves a 2-for-1 deal—even yogis. This shape combines a hip opener with a twist which means happy hips and a healthy spine. Starting with the left foot on the floor, take your right ankle to your left knee (yes, yoga is a great lesson in left and right) and open up your hip. Keep your right foot flexed to protect your knee. Take your left hand to your right knee and turn to look over your right shoulder. Keep your spine long and take 10 deep breaths looking to the right. Repeat on the other side. Channel your inner moon goddess (or god) with this pose. It's designed to help you lengthen your side-body, giving more space to your lungs and improving your breathing. While sitting, plant both feet on the floor and have them facing forward. Feel the balance between your hips as you stretch your arms overhead. Catch your left wrist with your right hand, flexing your left hand back towards your face, with your left palm towards the ceiling. Use the grip of your right hand to pull your left wrist over to the right. Keep your left hip grounded to feel the long stretch in your side-body. Inhale to lengthen up towards the ceiling and exhale to bend deeper to your right. Try to focus on and breathe into your left rib cage to increase the sensation. Stay for 5-10 breaths before moving to the other side. If you’ve ever been to a yoga class before, chances are you have a love-hate relationship with pigeon pose. It is the king of all hip openers and can often be challenging (physically and emotionally). If you don’t want to cause a scene by doing it on the floor, then try the standing option at your desk. Much more discrete. Standing up, keep your left leg on the floor and lift your right leg, flexing the foot and placing the knee-to-ankle horizontally along the desk in front of you, creating an “L” shape. If you can’t quite make that shape, try for more of a “V” by bringing your right foot closer to your body, flexing the foot at all times to keep your knee protected. Place your hands on the desk for stability and stretch the left leg out behind you, repositioning it further back until you feel a comfortable stretch. From there, lean forward towards your right shin, keeping your chest slightly lifted. Stay for 5-10 breaths. That’s not the technical name of this pose, but you’ll be saying either an elated “Hello” or a reluctant “Hi” to your psoas, depending on how flexi you’re feeling on the day. The psoas is a deep hip flexor muscle that gets super angry when you compress it by sitting all day. This pose looks simple, but trust me, you’ll be cursing my name in no time. Start desk-side by finding a comfortable place to kneel, then pick up your right foot and step it forward, stacking your knee on top of your ankle. Bring your left knee directly under your left hip. Take your hands and interlace them, placing the palms down on your thigh, drag the fleshy part of your thigh towards the knee as you begin to straighten your arms. Tuck your chin into your chest and look towards your belly. The more you round your spine, the more intense the stretch will be. Keep tucking your left hip under and forward to increase the sensation. Say hello to your psoas! Think about what you demand of your wrists every day. Typing, driving and hours scrolling Instagram. As the smallest joint complex in your body, this little guy takes a beating. Give your wrists some love by stretching them out. Take your right hand out in front of you, turn your hand to the right and spin your fingers down to face the floor. Your wrist will be facing up towards the sky, so you can use your other hand or the edge of your desk to create resistance. Push gently into the stretch and breathe into it for 5-10 breaths and change sides. Yep, that’s it’s official name. There’s a reason you naturally do this when you’re reclining on a beach in Bali. It’s a great way to open your heart (or “chest” for the literal types) which spends most of its time hunched forward over your computer, phone or the steering wheel. When your body is constantly hunched, it triggers a stress response that tells your body it’s in protection mode and running from a tiger (or a deadline, which is often just as scary). Not to mention it tightens your shoulder and the entire backline of your body. Opening through the chest will increase your energy levels, counter all the hunching and feel really, really good. Interlace your hands behind the nape of your neck (around where your hairline starts). Keep your chin tucked into your chest slightly to lengthen your spine, then begin to lean your head back into your hands, creating a slight resistance. Open your elbows out to the sides as you lean back into your hands, keeping your tailbone slightly tilted forward to protect your lower back. Take 5-10 breaths and visualise yourself on a beach. This one seems kind of obvious, yet it’s the most potent of all desk yoga. Breathing deep into your belly will instantly lower your stress levels and clear your head. When your exhale breath is longer than your inhale it brings your body into its ‘rest and digest’ response. That's the ultimate place from which to make important decisions. Sit comfortably, inhale through your nose into your belly for 4 counts, hold briefly at the top of your inhale, then exhale for 6 counts, holding for a moment on your exhale. Repeat this counted belly breathe for 10 rounds. You’ll notice a huge difference after just two. Try it a couple of times a day, especially if you’re about to walk into an important meeting or have just dealt with a stressful situation.